Anatoli Brouchkov is a soft-spoken guy with silver hair, and when he lets out a reserved chuckle, his eyes light up like he was belly laughing. If you met him on the street, you'd never guess that he once injected himself with a 3.5 million-year-old strain of bacteria, just to see what would happen. When I spoke with him at VICE's Toronto office in October, the permafrost scientist—also known as a geocryologist, currently stationed at Moscow State University—told me that he's feeling just fine. In fact, he says he's feeling healthier and less tired than ever. His most famous claim is that he hasn't had the flu in two years, which he coyly says may or may not have anything to do with the ancient bacteria he injected into his body. I am not skeptical about whether this happened, I am skeptical about whether this had (or could potentially have) any of the positive health benefits that the Russian scientist claims. Is there any scientific evidence to support any of this? Or even a scientific theory on how 3+ million year old bacteria could boost our own immune system? The "mad scientist" seems to be Anatoli V. Brouchkov, one of the authors of Draft Genome Sequence of Bacillus cereus Strain F, Isolated from Ancient Permafrost, detailing the organism's name as "Bacillus cereus Strain F", not "Bacillus F" as so commonly plagiarised in connection with this sensational news bait. Other subjects beyond what he did to himself make up a highly unusual minority group at best. Narrator: "Anatoli Brouchkov tested an extract of the bacteria on mice and has taken it himself. Though he says it's a food supplement. So Manoush's decision to inject is a new, possibly riskier stage of the experiment." Brouchkov: "I didn't recommend her any injections and I told her it was no injection. It was just, ah, consuming the extract of the bacteria. Well, I, what I can say. She is a very brave lady." That makes the conclusion quite obvious that Brouchkov did not inject living bacteria into himself. In whatever way he took the bacteria or an extract of them: his claims are not about injections, but about improved health in test animals and himself. Any claim about "injections" is up to the media to substantiate, sometime perhaps? Anatoli Brouchkov, head of the geocryology department at Moscow State University, says he drank million-year-old bacteria, and he tells the Russian TV network RT that he’s been working longer and hasn’t gotten the flu in two years. 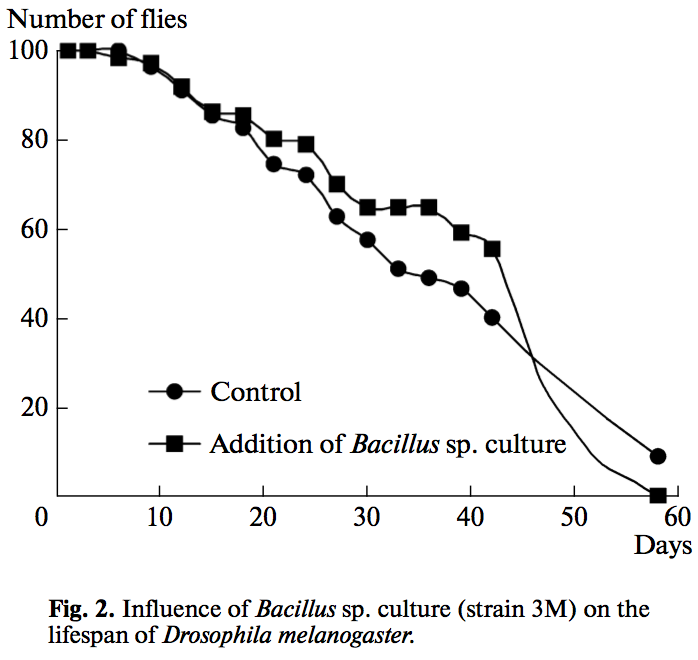 Testing in Drosophila melanogaster: The experiment was carried out in Drosophila melanogaster flies of the same age (24 h). Five pairs were placed in test tubes with a nutrient medium (5–7 ml). The volume of sampling was 100 flies for each group. Flies were selected for the experiment by etherization; the dead and surviving flies were counted every 3 days. The experiment was carried out with a 24 h culture of Bacillus sp. (strain 3M) grown in a meat–peptone broth. The culture (20 μl) was added to the test tube with the experimental group. In the control group, the flies were kept in the medium with yeasts; in the experimental group, the flies were kept in the medium with yeasts for the first 5 days and then in the medium with the bacillus for 24 h (alternated during the whole period of observation). secretion of antimicrobial compounds which suppress the growth of harmful bacteria (Duc et al. 2004). We propose that the notable probiotic properties of Bacillus cereus strain BF as compared with Bacillus cereus var. toyoi can be explained by the production of unknown bacteriocin-like inhibitory substances (unpublished data). We described the S. enterica var. enteritidis model as a variant to cause a chronic carrier state in mice after oral inoculation, as a model for a human carrier state. The pathogenic mechanism of S. enterica var. enteritidis action was connected with the gastrointestinal tract. Therefore, we used oral infection and treatment of mice. To protect mice from Salmonella infection, antibiotics or bacterial extracts can be used (Deng et al. 2007). Viable microorganisms such as yeast and bacterial species have been used to protect mice from Salmonella infection (Szabó et al. 2009). In our case, Bacillus cereus strain BF protected mice from Salmonella infection. Probiotic bacteria reduced colonization by pathogens and decreased host defense mechanisms. Preliminary results for Bacillus cereus strain BF showed an increase of the humoral and cell immunity of mice (Brouchkov et al. 2009). Thus, the possibility of oral treatment of mice infected with S. enterica var. enteritidis with probiotic Bacillus cereus strain BF, obtained from relict permafrost, was clearly demonstrated. Probiotic Activity of a Bacterial Strain Isolated from Ancient Permafrost Against Salmonella Infection in Mice. Other lines of inquiry may lie in specific compounds produced by this species, for example certain lipopeptides: Agricultural Sciences Effects of Bacillus cereus F-6 on Promoting Vanilla (Vanilla planifolia Andrews.) Plant Growth and Controlling Stem and Root Rot Disease. Or DNA-repair enzymes An unprecedented nucleic acid capture mechanism for excision of DNA damage (2010) or similar mechanisms of various types A new protein architecture for processing alkylation damaged DNA: the crystal structure of DNA glycosylase AlkD (2008). Whether this species simply lost its pathogenic potential, never developed it in the first place, all bacteria do stimulate an immune response. The evidence that probiotic supplements may help to prevent colds is weak, and little is known about their long-term safety. This article, or one like that (in other Russian newspapers) seems to have started this whole thing. Note the mismatch between headline and body text regarding 'injections'. As an anecdotal evidence Brouchkov claims about his personal health are irrelevant. If he were to market this strain as a probiotic, he'd have a tough time regarding these health claims in many markets. The possible effects claimed more by certain media than by him from a one-time shot of dead bacteria are wholly unlikely. For any effect over the claimed time span the procedure would have to be repeated. Live bacteria might have colonised him (that would be easily testable, but was apparently not carried out) and show beneficial effects (although that too is not very likely to the extent claimed in the articles in question). Most of the possible reasons for "health benefits" given by Brouchkov initially ('the bacteria are old, … therefore you grow older'/'exotic people living where we found them get older than expected…') are just nonsense. Russian geocryologist (scientist specialising on permafrost soils) finds 3.5 million-year-old bacteria in thawing Siberian soil, assumes after preliminary testing the bacteria's potential as a trendy pro-biotic, eats it, says he is fine. Only one effect of this bacterium is crystal clear: it makes you immortal – by getting you into the news. Anatoli Brouchkov, head of the Geocryology Department at Moscow State University, says he has not had flu for two years following his injection. Accurately estimating the incidence of influenza is difficult (since the majority of cases go unreported), and there is significant local variation (due to differences in prophylactic practices and population density), but the WHO estimates the annual morbidity rate at 5-15%. Even assuming the higher bound (and assuming that the probability of getting the flu one year does not influence the probability of getting the flu the following year), that can be extrapolated to a two-year morbidity rate of ~28%. So Brouchkov not having contracted the flu over that period is not particularly strong evidence that he "never gets ill". To be fair, however, Brouchkov has not, as far as I can tell, made any statements as extreme as those implied in the articles, nor overstated the impact of his n=1 anecdotal evidence. [Neither Vice nor The Daily Mail is known for a strict devotion to the truth.] His group has published academic papers describing more formal experiments with the bacteria, such as this one. If you are skeptical of the separate claims made in those, you may want to start a new question for them. You can also consider similar health claims and wonder about the similarities/differences. But a study with one person, no controlled dose-taking, nor any double-blind protocol is nothing but an anecdote. And anecdotes are useful starting points for medical research --- after a few chimney sweeps or watch painting girls come in with a very unusual cancer, that group gets studied closely and a clear link is found. Dramatic effects like that are easier to spot (see wildly varying and contradictory conclusions over decades about possible benefits and damages from alcohol, at different doses and ages, and different drinks, and/or pregnancy; same with coffee). So if you have one case with a claimed benefit (here permafrost juice, marketable as a Permafrostie? ; or venom), you go compare with a peer group (snake handlers for the latter, whether herpetologists, pest removers, habitual idiots, or Appalachian pentecostals; some of those deal with one species, some with multiple; but probably nobody is like your guy). If you can't find a peer group, you consider possible mechanisms how it would work, and why this specific substance (e.g., why permafrost stuff, from extremely early human history elsewhere? Why not 5000y? 1000y? 50Ky? All probably available from arctic ice core samples). So you consider a class of mechanisms/causes/... , here clearly 'probiotics' which is a nicely feel-goody-not-thinkie-too-much marketing term. Not the answer you're looking for? Browse other questions tagged medical-science biology immune-system .